X-ray inspection systems for use in the electronics industry have become an important and growing part of the production process. Owing to their ability to detect contaminants, defects, and other inconsistencies in products they are increasingly being seen as an important screening tool for risk management and quality control. A recent study predicts the global industrial X-ray inspection equipment and imaging software market to register a CAGR of about 6.8% between 2018 and 2023. The boosts for X-ray inspection are largely provided by the steady trend towards using smaller, more densely populated printed circuit board assemblies (PCBAs) in electronics. And these boosts are two-fold. In the first place, smaller PCB assemblies make faults difficult to detect with the naked eye. And in the second place, new designs now often use hidden solder connections, such as quad flat no-leads (QFN) and land grid arrays (LGAs) where even Automated Optical Inspection (AOI) is of limited value. Used in process control, X-ray inspections can help remove the risk of producing assemblies that are impossible or uneconomical to repair. This helps to cut down on costs and additional production time if a failure is found later in the production process. Manufacturers are understandably keen to avoid faults being found at the JTAG – Joint Test Action Group (JTAG), the industry standard for verifying designs and testing PCBs after manufacture – or functional test stage. Quality control can be enhanced by the use of 3D X-ray capability. By this means the inspector is able to ‘walk through’ an assembly and find any faults, such as broken tracks or barrels in a PCB, as well as any issues with leadless components. There are numerous vendors of X-ray inspection systems on the market. But it is important to choose the most appropriate one. Factors to consider include: the desired image quality; whether to opt for 2D, 2.5D or 3D systems; ease of use; and maintenance. In June, Limtronik GmbH announced that it had acquired from GOEPEL Electronic a new ‘intelligent 3D’ AXI (automatic X-ray inspection) system for use at its Electronic Manufacturing Services (EMS) plant in Limburg. The new 3D Series 300 updates the previous 3D Series 100 AXI system that Limtronik acquired from the same company in 2010. The X-ray line is operated as a separate island solution next to the Limburg factory’s three surface mount device (SMD) lines, enabling it to flexibly inspect the products of all three lines. The focus is on the invisible solder joints. 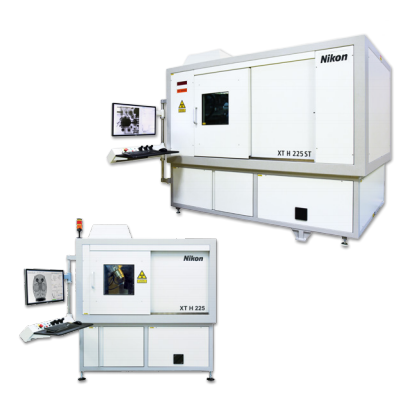 Nikon Metrology, the manufacturer of X-ray and Computed Tomography inspection systems, recently launched XT H 225 ST for CT scanning. The system is suited to a wide range of materials and sample sizes, especially those that are too large or heavy for other systems in the Nikon range. The Nikon system is now used by Nexus Metrology, a division of Trikon Technologies Inc. Meanwhile, there is now a range of what are described as eco-friendly systems that are beginning to come on offer. At a recent industry event, Yxlon International part of the COMET Group, launched the Cheetah and Cougar ECO X-ray inspection systems. These two ‘micro-focus’ systems, which come in two size variants were developed by Yxlon, as entry-level systems. Cougar and Cheetah feature: high-resolution FeinFocus X-ray tubes; sophisticated target technology; a finely calibrated flat-panel detector; and state-of-the-art manipulation technology. So it is clear that the prospects for the various X-ray inspection systems are assured. Indeed, the expectation is that even where there is residual resistance about implementing the technology – on safety grounds – the growth of ‘automatic’ digital X-ray inspection systems that reduce human interference in the process will provide enough of a supplementary boost to the X-ray inspections market to ensure that the growth trend continues unabated.